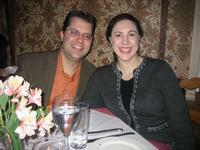 My husband Chris and I were married on May 27, 2007 in Stowe, VT. Choosing our honeymoon destination was quite a challenge, as we had just bought a house, and finances were tight. We wanted to do something a little more memorable than the typical beach honeymoon, and so after much deliberation, we settled on Charleston, S.C. as our destination. Both of us are big history buffs – I love to explore old cities and take in the art and architecture, and Chris is fascinated by American military history, especially the Civil War. Charleston was perfect for us, as it is steeped in art, folklore and culture, and also happens to be the location of the first shots fired in the Civil War (or the War of Northern Aggression, as we heard it referred to by several native Charlestonians). For the first few days of our trip, we stayed at the Lowndes Grove Plantation, the only surviving plantation house on the Charleston peninsula. Driving from the airport to the plantation, we were surprised to find ourselves traveling into Charleston’s residential neighborhoods, but once we cleared the front gates of the property, we were transported back in time to antebellum days. The mansion stands on 14 of the plantation’s original 325 acres, and sits on the banks of the Ashley River. Staying here, we felt as though we were miles away from modern civilization. The whole inn is furnished with exquisite pieces from the Federal period, and our room was no exception. We stayed in the William Lowndes room, which features a king-sized canopy bed and other mahogany antiques, a working fireplace, and a bird’s eye view of the beautiful grove, with its majestic magnolias that line the banks of the Ashley River. After dark, the magnolias are illuminated with fairy lights, and it was a truly magical experience to sit on the second-floor verandah, enjoying the cool breeze off the river and watching the delicate lights dance across the fountain below. The staff was professional and welcoming, the breakfast was home cooked and made to order each morning, and every night a crystal decanter of sherry was set out upon the second-floor landing (just outside our door). Our experience at Lowndes Grove lived up to our expectations of what pure Southern charm was all about. For the second half of our trip, we stayed at the Jasmine House, located in the heart of Charleston’s Historic District. This small bed and breakfast is located just a block off of the aptly named Meeting Street, where people can be found strolling leisurely at all times of the day or night. The Jasmine House was surprisingly quiet, and our room – the Canton Room – was even better than what we had imagined, from the photos we saw online. Located on the second floor of the house, it has a grand and decadent feel to it, with its 14-foot ceilings, ivory mantelpiece (again with a working fireplace) and a private verandah, upon which we enjoyed our coffee and breakfast every morning. Breakfast was quite an elaborate spread each morning, consisting of an assortment of homemade pastries, fresh fruit, yogurt, muffins, mini pancakes (my favorite) and the standard eggs and bacon. It was truly decadent. Each evening, the Jasmine House also served wine with cheese and crackers, which made for a lovely break between sightseeing and dinner. There was so much to do in Charleston, and once we arrived, we realized that there was simply no way we were going to fit everything in, so we had to set our priorities and try not to overdo it. It was our honeymoon, after all! I will touch on a few of the highlights of our trip. We had done some research before booking our trip, and the one thing that all the different guides and online travel forums we consulted agreed on, was that a private horse-drawn carriage tour through the Historic District was absolutely worth the $100 price tag. After experiencing the tour for ourselves, we wholeheartedly agree. We chose Palmetto Carriage Tours, based mainly on the photos in their brochure, honestly. One interesting thing about carriage tours in Charleston: you can’t choose where you are going to go. Routes for all carriage tours are a lottery, with each carriage’s route determined at the last minute. Since there are so many companies, they can't all take the same route at the same time. To determine where each tour will go, they use a bingo machine to draw a number of your designated route, and you won't know where you are going until the last minute. We were extremely pleased with our route, which took us down Church Street, on to the the Battery, and up Meeting Street. Our tour guide, Ed, was wonderful. He had so many stories to share with us, and made the history of the city really come alive for us. He was also able to answer all of our questions, which was no small feat! The tour was over before we knew it, but it helped us to get our bearings, and to decide where to go on our own. Probably our favorite pastime during our stay was strolling up and down the streets running perpendicular to the renowned Battery Park. We spent hours on Meeting Street alone, admiring the grandiose homes built around the time of the Revolutionary and Civil Wars. Many of these stately homes are opened to the public for tours during the day, and then reverted back to the family home every evening. My favorite part was peering through the bars of the wrought iron gates to steal a glimpse of the tiny garden courtyards hidden between the tall narrow houses. While we did do a couple of the guided house tours, we felt that the admission prices were somewhat high (about $15 apiece) for the speed with which we were whisked through the houses. We often had to stand behind ropes several feet back from whatever piece of furniture we were supposed to be admiring, and couldn’t see over the shoulders of the folks in front of us. One house that was simply stunning on the outside was the Calhoun Mansion. It is the largest single-family residence in the country, aside from the famous Biltmore Estate in North Carolina. While the gardens were spectacular (and didn’t cost anything to walk through), and the façade was extremely impressive, the inside of the house was mainly furnished in the current owner’s personal taste, which didn’t really offer any real insight into the home’s historical significance. One day we decided to explore beyond the historical district, and we squeezed several small trips into an afternoon. The highlight of the whole trip for me was our visit to Magnolia Gardens and Plantation. There are several plantations located about 45 minutes outside the city, along the Ashley River. We chose Magnolia Gardens because it seemed to offer the most attractions in one spot. We took a guided tour of the house, which we felt was a much better value than the houses downtown. The house was still furnished with the same pieces that were used by the Drayton family, who owned the house for most of the 19th century. But the gardens were what really took my breath away. I felt like we were walking through Monet’s gardens in Giverny. There were camellia trees, magnolias, and huge bushes of hydrangeas. There were live oaks draped with Spanish moss. There were ponds with the requisite water lilies and white wood-latticed bridges. There was a bamboo garden, and a swamp garden, and a Buddhist prayer garden. It would have been just perfect if my husband hadn’t casually remarked as we were leaving, “Well, it’s certainly beautiful, but just think about the hundreds of slaves upon whose backs this beauty was wrought.” Today, paid gardeners maintain all the gardens. Of course, I cannot end my trip report without talking about the amazing meals we had in Charleston. All of our dining experiences were positive, but again, there were a few that really stood out. The best place we stopped for lunch was hands down Jestine’s Kitchen, which we had read about in one of our tour books. I am still not sure how we managed to get there when there wasn’t a huge line out the door, as that was the norm on every day that followed. My husband had chicken fried steak, and I broke down and ordered a greasy cheeseburger and fries. I don’t know why those standard selections were so much better than when we order them at home, but they were. There’s just something about that Low Country cooking that simply can’t be compared. For dessert we split a coconut cream pie that was so heavenly, with a dense cream pudding base and a layer of light fluffy meringue, topped off with warm toasted slivers of coconut. Delectable. We are still talking about that pie several months later. I wish we had gone back for more. Our favorite evening dining experience was at the Peninsula Grill, the restaurant affiliated with the Planters Inn. It was an easy walk from our B&B, located on the corner of Meeting Street and Market Street. It wasn’t as much the food (although delicious) that made it such a wonderful experience for us as it was the service. The waitstaff was friendly and professional, and incredibly knowledgeable about their menu and wine list. The way that they worked in teams was intriguing to watch; their timing was impeccable, and it was all done without any obvious communication between them. I loved watching as patrons would leave their seats for a moment, and immediately the closest waiter would hurry over, pick up the discarded napkin, and twirl it into a festive knot, left sitting on the guest’s chair in anticipation of their return. Sometimes it’s the smallest things that leave the biggest impression. The dessert we had there was also unbelievable – it was called “Death by Chocolate” and included just about every type of chocolate delicacy that one would care to eat. It was an artistic concoction that included chocolate cake, chocolate sauce, chocolate ganache, chocolate ice cream, and chocolate soufflé, finished off with a little shot glass of milk on the side… it was all arranged in such a beautiful way that we were almost sorry to eat it. But of course we did. And silly as it was, we just loved the fact that our waitress had the chef write in chocolate script across the plate, “Congratulations!” because we were newlyweds. All in all, our stay in Charleston was amazing. We didn’t even get to see half of the things that were originally on our list, and so we are already talking about taking an anniversary trip there. Cost-wise, we felt that our trip was very affordable. Airfare from Burlington, VT to Charleston was $600 per person, but that is most likely because we chose to fly out of Vermont, instead of driving to a larger airport in one of our neighboring states. After airfare, we spent about $2000. We didn’t even try to be frugal, once we were there, although we did take cost into consideration when selecting our hotels. Each of our hotels was less than $250, before tax. I would recommend Charleston to anyone! There is something there for every age, and if you are into American history at all, you will absolutely love it.